Sixty endangered giant pandas, adopted by zoos across China after an earthquake destroyed their Wolong Reserve habitat four years ago, are finally going home. In 2008, an 8.0-magnitude earthquake that struck Sichuan Province also destroyed part of the Wolong Reserve, the world’s largest giant panda breeding centre. It left one panda dead, one injured and one missing. 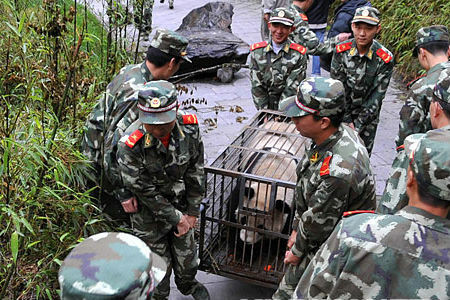 The remaining 60, then homeless, were sent to zoos in Guangzhou, Shanghai, Wuhan and some were moved to a breeding base in Ya’an. “The construction of a new breeding centre will be completed in September. Then those pandas now living in other places will be able to come back here in batches,” said Zhang Hemin, director of the China Conservation And Research Centre in Wolong. “Returning home not only means that the pandas will be back where they belong in Sichuan, but also that those pandas raised in captivity will finally get to be released into the wild which is their real home,” Zhang told Xinhua daily. Giant pandas are among the world’s most endangered species. According to state forestry officials, about 1,600 pandas live in the wild mostly in the Sichuan Mountains, while another 300 are in captivity in zoos around the world. 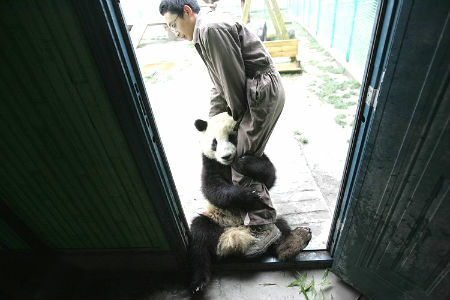 Zoologists believe releasing pandas into the wild will reduce the risk of inbreeding among the animal’s wild partners. On top of their research for better breeding techniques and serving as a public educator for wildlife protection, the new centre will become more prominent as a training centre for giant pandas destined to be released into the wild after being born in captivity, said Zhang. Next Article Is NASA’s Voyager about to leave the Solar System?